A woman lights candles at a memorial for Prince near "Paisley Park" in Chanhassen, MN. Prince Rodgers Nelson, the iconic singer, and the most famous person to come out of Minneapolis died on April 21, 2016. We went back out to Paisley Park on April 21, 2017, to mark the one year anniversary of his death. 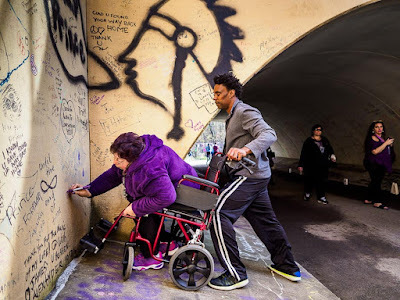 With the help of a passerby, a woman leaves a note for Prince in the pedestrian tunnel that goes below the highway in front of Paisley Park. Both people traveled to Minneapolis from out of state to participate in Prince memorials. The sense of grief was still palpable. 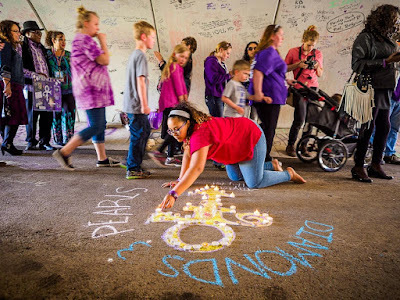 The public didn't have access to Paisley Park (admission was limited to ticket holders), so the tunnel leading to his home was turned into a memorial. Some people left memorials on the fence surrounding Paisley Park, but most people gathered in the tunnel. 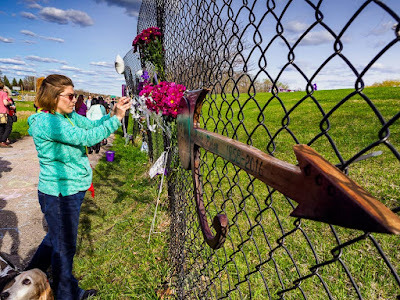 A woman takes a picture of flowers on the fence at Paisley Park, next to a carved replica of Prince's most famous guitar. In the tunnel, people sign a wall decorated with Prince's logo. 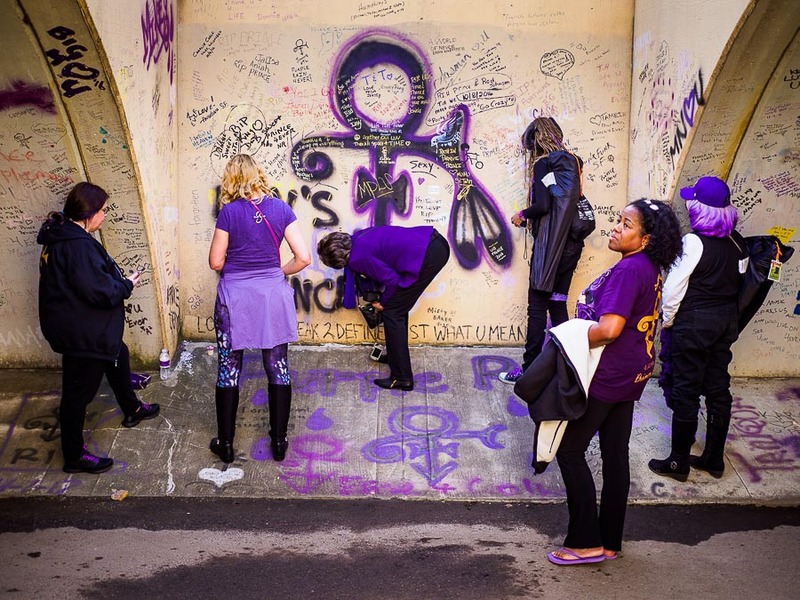 There were also memorial events at First Ave, the nightclub Prince made famous in his movie "Purpple Rain." 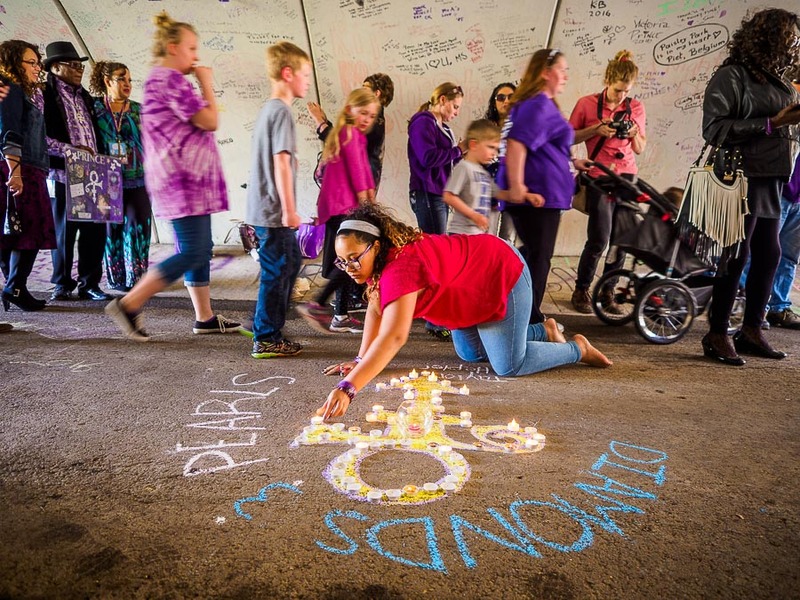 What struck me at Paisley Park was how most of the people in the tunnel were from out of town. Maybe Minnesotans skipped Paisley Park and went to the First Ave dance parties but it seemed like almost everyone outside the Paisley Park fence was from somewhere else.